The performance was conducted by Dr. Valerie Bullock, Director of The Singers of Summerville, and Professor Emeritus at Charleston Southern University, having retired in June 2016. At CSU she was Chair of the Horton School of Music, Professor of Music and Director of Choral Activities where she conducted the University Concert Singers and Bel Canto, as well as coordinating choral music education. Dr. Bullock received her doctorate in choral music education from Florida State University and Masters and Bachelor Degrees from the University of South Carolina. Dr. Bullock is now serving as the Director of Music Ministries at Bethany United Methodist Church in Summerville. Associate Conductor, Joe Swisher has taught general and choral music to over 15,ooo students in four Berkeley County Schools for 31 years. A National Board Certified teacher, he has led a large award-winning choral program at College Park Middle School for the past 14 years and he has also directed Berkeley County's talented and gifted choral program each summer for most of his career. He has written, won, and administered several large grants for his progrms throughout the years. Also, he has served as Music Director of Peace Presbyterian Church in Goose Creek, SC for 22 years, sang for many years in the Charleston Symphony Orchestra Singers' Guild, and with the Singers of Summerville since 2010. The accompanist was Canadian pianist Brad Parker who has performed extensively as a soloist and collaborative pianist in the United States, Canada, France, Italy, and Haiti. In the first year of his residency in Charleston, he has performed with the Charleston Symphony Orchestra, the Charleston Wind Symphony, and the Charleston Men's Chorus, as well as performing a recital in the Emily Remington Concert Series and the Piccolo Spoleto Festival. Dr. Parker is an Associate Professor and Keyboard Area Coordinator at Charleston Southern University, where he teaches piano and other music courses. His passion for musical instruction led him to volunteer for several summers at the North Haiti Music Camp, on the campus of the Christian University of North Haiti. He completed a Masters and DMA in Piano Performance at the Eastman School of Music in Rochester, New York, and spent one year in France studying French music with pianist Jean Koerner at the Paris Conservatory. He previously studied at Wilfrid Laurier University at Waterloo, Canada, where he earned a Bachelor of Music with Distinction. Boy Soprano Soloist Eason Bazemore is a fifth grade student at the First Baptist School in Charleston, SC. He is a member of the Canterbury Choir of St. Philip's Church and recently performed at the American Choral Director's Association Conference. Eason is a member of the First Baptist School's choir and has been a featured soloist in several of their concerts. One of the highlights from this school year was playing the role of Young Simba in the First Baptist School's production of the The Lion King. In the Fall of 2018, Eason will be attending the Charleston County School of the Arts. Soprano soloist Lee Whittington Ousley is a native of Florence, SC. She is a doctoral candidate in vocal performance at the University of South Carolina, received a Bachelor of Music Degree from Furman University and earned a Master of Music degree from Manhattan School of Music. Mrs. Ousley has taught in the public school system as an instructor of music in both North and South Carolina. She was formerly on the music faculty at Francis Maron University and Coker College and has taught voice lessons through her private voice studio, Charleston Southern University, Columbia Arts Academy, Lexington School of Music, and Florence's Music Depot. Mrs. Ousley continues to be active as a performer and most recently sang the role of Donna Anna in Mozart's Don Giovanni Saint-Saens' Helene and the soprano solos of Mozart's Requiem and Rutter's Requiem/ She relocated to the Greater Charleston area with her husband, son, and faithful poodle, and teaches preschool music at Bethany United Methodist Church Child Development Center and directs the Lowcountry Home School Children and Youth Choirs. Tenor soloist Dr. Dustin Ousley is an Assistant Professor of Music and the Director of Choral Activities at Charleston Southern University where he conducts the Concert Singers and Singing Bucaneers. He earned a Doctor of Music degree in choral conducting from the University of South Carolina where he served as conductor of the USC Women's Chorus. He has a Bachelor of Arts degree in music from Furman University and a master's degree in choral conducting from the University of North Carolina at Greensboro. The Chamber Ensemble members were: Violin: Micah Gangwer Cello Damian Kremer Flute Regina Helcher Oboe Kari Kistler Horn Brandon Nichols Timpani Beth Albert Percussion Anthony McCall Harp Holly Avesian Organ Michael Lopez Piano Brad Parker. Special Thanks to Jo Hethcox, The St. Philip's Church Staff,Linda Falter, program notes St. Matthias Anglican Church, Summerton, SC, program printing , Bethany United Methodist Church,, rehearsal venue, and in particular our Supporters and all others who helped make this concert possible! "The Great American Songbook II"
The performance was conducted by Dr. Valerie Bullock, Director of the The Singers of Summerville, and Professor Emeritus at Charleston Southern University, having retired in June 2016. At CSU she was Chair of the Horton School of Music, Professor of Music and Director of Choral Activities where she conducted the University Concert Singers and Bel Canto, as well as coordinating choral music education. Dr. Bullock received her doctorate in choral music education from Florida State University and Masters and Bachelor Degrees from the University of South Carolina. Our Associate Conductor, Joe Swisher has taught general and choral music to over 15,ooo students in four Berkeley County Schools for 31 years. A National Board Certified teacher, he has led a large award-winning choral program at College Park Middle School for the past 14 years and he has also directed Berkeley County's talented and gifted choral program each summer for most of his career. He has written, won, and administered several large grants for his progrms throughout the years. Also, he has served as Music Director of Peace Presbyterian Church in Goose Creek, SC for 22 years and sang for may years in the Charleston Symphony Orchestra Singers' Guild and with the Singers of Summerville since 2010. The accompanist was Canadian pianist Brad Parker who has performed extensively as a soloist and collaborative pianist in the United States, Canada, France, Italy, and Haiti. In the first year of his residency in Charleston, he has performed with the Charleston Symphony Orchestra, the Charleston Wind Symphony, and the Charleston Men's Chorus, as well as performing a recital in the Emily Remington Concert Series and the Piccolo Spoleto Festival. Percussionist was Nicholas Holland. Bass was Mitch Goodwin. Special Thanks to Jack Sehrt, Emcee, Linda Falter, program notes, Julia Miller,prompter, St. Matthias Anglican Church, Summerton, SC, program and ticket printing , Bethany United Methodist Church,, rehearsal and concert venue, our ticket and program crew and our Supporters and all others who helped make this concert possible! 6th Annual "Handel's MESSIAH Sing-Along"
The performance was conducted by Dr. Valerie Bullock, Director of the The Singers of Summerville, and Professor Emeritus at Charleston Southern University, North Charleston, South Carolina, having retired in June 2016, where she was Chair of the Horton School of Music, Professor of Music and Director of Choral Activities. Instrumentalists were: Micah Gangwer, violin Mayumi Nakamura-Smith , violin Jan-Marie Joyce , viola Elizabeth Murphy , cello, Zach Hammond, oboe, Kari Kistler, oboe, and Julie Harlowe, Harpsichord. Rehearsal accompanist was Bradley Parker. Tenor soloist Dr. Dustin Ousley is an Assistant Professor of Music and the Director of Choral Activities at Charleston Southern University where he conducts the Concert Singers and Singing Bucaneers. He earned a Doctor of Music degree in choral conducting from the University of South Carolina where he served as conductor of the USC Women's Chorus. He has a Bachelor of Arts degree in music from Furman University and a master's degree in choral conducting from the University of North Carolina at Greensboro. The Chamber Ensemble members were: Violin: Ales Boissonault, Cello Damian Kremeront , Flute Jessica Hull-Dambaugh, Oboe Kari Kistler, Horn Susan Bocook, Percussion, Nicholas Holland and Anthony McCall, Harp Holly Avesian and Organ, Michael Lopez. Special Thanks to Dave Braddon, Emcee, Linda Falter, program notes, St. Matthias Anglican Church, Summerton, SC, program printing , Bethany United Methodist Church,, rehearsal venue, Bethany United Methodist Church, concert venue, our ticket and program crew and in particular our Supporters and all others who helped make this concert possible! The performance was conducted by Dr. Valerie Bullock, Director of the The Singers of Summerville, and Professor Emeritus at Charleston Southern University, having retired in June 2016. At CSU she was Chair of the Horton School of Music, Professor of Music and Director of Choral Activities where she conducted the University Concert Singers and Bel Canto, as well as coordinating choral music education. Dr. Bullock received her doctorate in choral music education from Florida State University and Masters and Bachelor Degrees from the University of South Carolina. The accompanist was Canadian pianist Brad Parker who has performed extensively as a soloist and collaborative pianist in the United States, Canada, France, Italy, and Haiti. In the first year of his residency in Charleston, he has performed with the Charleston Symphony Orchestra, the Charleston Wind Symphony, and the Charleston Men's Chorus, as well as performing a recital in the Emily Remington Concert Series and the Piccolo Spoleto Festival. Piano accompanist Wayne Helmly holds Master of Music degrees in piano performance and choral music education. He is an experienced performer, teacher, church musician, and music director of musical theater. He surrently teaches piano at Dubose Middle School where he was teacher of the year in 2009 and has served as a Dorchester District Two Honor Teacher. Since 2010 he has been the Organist/Choirmaster at St Stephen's Episcopal Church in Charleston. An active Episcopalian, his choral setting of Evensong, The Anson Street Blues Service, was recently premiered at a service honoring The Most Rev. Michael Curry, Presiding Bishop of The Epicsopal Church. Percussionist was Nicholas Holland. Bass was Roman Pekar. Special Thanks to Chris Falter, Emcee, Linda Falter, program notes, St. Matthias Church, Summerton, SC, program printing , Bethany United Methodist Church,, rehearsal venue, St. Luke's Lutheran Church, concert venue, our ticket and program crew and in particular The Taylor Agency, Concert Sponsor, as well as our Supporters and all others who helped make this concert possible! 5th Annual "Handel's MESSIAH Sing-Along"
The performance was conducted by Dr. Valerie Bullock, Director of the The Singers of Summerville, and Professor Emeritus at Charleston Southern University, North Charleston, South Carolina, having retired in June 2016, where she was Chair of the Horton School of Music, Professor of Music and Director of Choral Activities. Instrumentalists were: Micah Gangwer, violin Mayumi Nakamura-Smith , violin Jan-Marie Joyce , viola Damian Kremer , cello, Zach Hammond, oboe, Kari Kistler, oboe, and Julie Harlowe, Harpsichord. Rehearsal accompanist was Bradley Parker. The performance was conducted by Dr. Valerie Bullock, Director of the The Singers of Summerville, and Professor Emeritus at Charleston Southern University, North Charleston, South Carolina having retired in June 2016. At Charleston Southern University she was Chair of the Horton School of Music, Professor of Music and Director of Choral Activities where she conducted the University Concert Singers and Bel Canto, as well as coordinating choral music education. Dr. Bullock received her doctorate in choral music education from Florida State University and Masters and Bachelor Degrees from the University of South Carolina, and Assistant Director of the Singers of Summerville, Matt Sims ,Minister of Music at Highland Park Baptist Church in Hanahan, South Carolina. He received his Bachelor of Arts in Music from Charleston Southern University. While at CSU, Mr. Sims performed in various ensembles including Concert Choir, Chamber Singers and Concerts Singers all under the direction of Dr. Valerie Bullock. He also toured with New Vision, CSU’s Contemporary Christian outreach singing group. Mr. Sims was a part of two Opera/Musical Theatre workshops that would eventually become CSU's Lyric Theatre. Since graduating, he has been a guest vocalist with the Lyric Theatre ensemble in Kurt Weil and Arnold Sundgaard's "Down in the Valley", and performed the title role in Georges Bizet's "Doctor Miracle". He has also performed with Summerville's Flowertown Players as Max Detweiler in "The Sound of Music". Mr. Sims has been a choral member and frequent soloist of the Singers of Summerville for eight years. Rehearsal Accompanist was Canadian pianist Dr. Brad Parker Associate Professor of Music and Keyboard Area Coordinator at Charleston Southern University where he teaches piano and other music courses. Dr. Parker has performed extensively as a soloist and collaborative pianist in the United States, Canada, France, Italy and Haiti. In the first year of his residency in Charleston, South Carolina, he has performed with the Charleston Symphony Orchestra, the Charleston Wind Symphony, and the Charleston Men's chorus, as well as performing a recital in the Emily Remington Concert Series and the Piccolo Spoleto Festival. His passion for musical instruction led him to volunteer for several summers at the North Haiti Music Camp, on the campus of Christian University of North Haiti. Dr. Parker completed a Masters and DMA in Piano Performance at the Eastman School of Music in Rochester, New York, and spent one year in France studying French music with pianist Jean Koemer at the Paris Conservatory. He perviously studied at Wilfred University in Waterloo, Canada, where he earned a Bachelor of Music with Distinction. Chamber Ensemble Instrumentalists were: Micah Gangwer, violin Alex Boissonault, violin Jan-Marie Joyce, viola Norbert Lewandowski, cello Roman Pekar, bass and Michael Lopes, organ. When You Believe , sung by the RMSA Star Singers. Under the Sea , sung by the Singers of Summerville Chamber Ensemble. Seize the Day, sung by the RMSA Star Singers. The Colors of the Wind, sung by the RMSA Star Singers. The performance was conducted by Dr. Valerie Bullock, Director of the The Singers of Summerville, and Chair of the Horton School of Music, Professor of Music and Director of Choral Activities at Charleston Southern University, North Charleston, South Carolina, and Mr. David Richardson , Assistant Director of the Singers of Summerville and a respected choral conductor and music educator in the Charleston tri-county area. He is currently Director of the Vocal Music Arts at Rollings Middle School of the Arts in Summerville, South Carolina. The accompanist was Brad Parker a Canadian pianist who has worked with choirs in churches, colleges, and communities for fifteen years. He performs regularly as a soloist and collaborative pianist, having been heard in several states and countries. Relatively new to the Low Country, Brad recently assumed the post of Associate Professor of Music and Piano Area Coordinator at Charleston Southern University; Percussionist was Nicholas Holland. Special Thanks to Don Clerico, Emcee, Linda Falter, program notes, St. Matthias Church, Summerton, SC, program printing , and Eddie Sayetta, Fred Worthy,and Ed Barnes Summerville Baptist Church, and in particular The Taylor Agency, Concert Sporsor, as well as our Supporters and all others who helped make this concert possible! 4th Annual "Handel's MESSIAH Sing-Along"
The performance was conducted by Dr. Valerie Bullock, Director of the The Singers of Summerville, and Chair of the Horton School of Music, Professor of Music and Director of Choral Activities at Charleston Southern University, North Charleston, South Carolina; Instrumentalists were: Micah Gangwer, violin Mayumi Nakamura-Smith , violin Peter Kiral , viola Norbert Lewandowski, cello, Zach Hammond, oboe, Janice Crews, oboe, and Julie Harlowe, Harpsichord. Rehearsal accompanist was Bradley Parker. The performance was conducted by Dr. Valerie Bullock, Director of the The Singers of Summerville, and Chair of the Horton School of Music, Professor of Music and Director of Choral Activities at Charleston Southern University, North Charleston, South Carolina, and Assistant Director of the Singers of Summerville David Richardson Director of Vocal Music, Rollings Middle School of the Arts,and previously Director of Choral Activities, Fort Dorchester High School, North Charleston, SC; former conductor for the Charleston Symphony Orchestra Spiritual Ensemble, and current Associate Director of Children and Youth Choirs at Bethany United Methodist Church. Instrumentalists were: Micah Gangwer , violin Mayumi Nakamura-Smith , violin Alex Agrest, viola, Norbert Lewandowski, cello, and Julie Harlowe, Harpsichord. Rehearsal accompanist was Canadian pianist Brad Parker new Low country resident and Associate Professor of Music and Piano Area Coordinator at Charleston Southern University. "We Love Lerner & Loewe"
The performance was conducted by Dr. Valerie Bullock, Director of the The Singers of Summerville, and Chair of the Horton School of Music, Professor of Music and Director of Choral Activities at Charleston Southern University, North Charleston, South Carolina. The accompanist was Wayne Helmly who holds Master Degrees in piano performance and choral music education. Mr. Helmly is the Organist/Choirmaster at St. Stephen's Episcopal Church in Charleston, SC and also teaches piano at Summerville's Dubose Middle School, where he was named Teacher fo the Year in 2009, and has served as Dorchester District Two Honor Teacher. Special Thanks to Linda Falter, program notes,Shirley Berardo, publicity, , and Eddie Sayetta, Fred Worthy, Summerville Baptist Church , as well as our Supporters and all others who helped make this concert possible! 3rd Annual "Handel's MESSIAH Sing-Along"
The performance was conducted by Dr. Valerie Bullock, Director of the The Singers of Summerville, and Chair of the Horton School of Music, Professor of Music and Director of Choral Activities at Charleston Southern University, North Charleston, South Carolina; Instrumentalists were: Mayumi Nakamura-Smith, violin Ellie Jos , violin Jan-Marie Joyce , viola Aubrey Gray, cello, Kari Kristler, oboe, Bill Parrish, oboe, and Julie Harlowe, Harpsichord. Rehearsal accompanist was David Richardson. "An Afternoon of Sacred French Music"
The performance was conducted by Dr. Valerie Bullock, Director of the The Singers of Summerville, and Chair of the Horton School of Music, Professor of Music and Director of Choral Activities at Charleston Southern University, North Charleston, South Carolina, and Assistant Director of the Singers of Summerville David Richardson Director of Choral Activities, Fort Dorchester High School, North Charleston, SC; former conductor for the Charleston Symphony Orchestra Spiritual Ensemble, and current Associate Director of Children and Youth Choirs at Bethany United Methodist Church. The organ accompanist was English Morris , Professional Church Musician, Music Educator, business owner, and native of Columbia, SC. Mr. Morris is President and Founder of Carolina Music Academy, a 38 year-old community music school and conservatory, and he has been a lay professional in church music for more than four decades. He has been Minister of Music and Organist for the past 27 years at St. Martin's-in-the-Fields Episcopal Church in Columbia. Additionally, he has twice served as Organist-in-Residence at York Minister Cathedral, York, England and in 2012 completed a term as Visiting Organist at Canterbury Cathedral, Canterbury, England with the Charleston Southern University Concert Singers. Instrumentalists were: Asako Kremer , Acting Principal Second Violin at Charleston Symphony Orchestra, Charleston, SC and Kathleen Wilson Principal Harpist with the Charleston Symphony Orchestra, the only Charleston, SC conservatory-trained harpist with both a bachelor and master of music degree in harp performance. Special thanks to Ed Schneider Minister of Music, Bethany UMC, the Bethany staff, and our Supporters whose generous contributions make these concerts possible. "What I Did For Love - 100 Years of Showtunes"
CLOSING sung by The Singers of Summerville & The Flowertown Players. The performance was directed by David McLaughlin with narration by Christine Kohler Channel 2 News, Charleston, SC and Shelby Dangerfield Miss Summerville 2014. The Sound of Music music and words by Richard Rodgers and Oscar Hammerstein II arr by Clay Warnick with soloist Amanda Larkin, soprano. The performance was conducted by Dr. Valerie Bullock, Director of the The Singers of Summerville, and Chair of the Horton School of Music, Professor of Music and Director of Choral Activities at Charleston Southern University, North Charleston, South Carolina, and Assistant Director of the Singers of Summerville David Richardson Director of Choral Activities, Fort Dorchester High School, North Charleston, SC, Conductor for the Charleston Symphony Orchestra Spiritual Ensemble, and Assistant Director of Music at Bethany United Methodist Church. The accompanist was Matthew Wilkinson, Assistant Organist at St. Michael's Church, Charleston, SC and staff accompanist at Charleston Southern University. Special thanks to Jan Martin, Emcee for the evening and Eddie Sayetta, Ed Barnes, John Nettles, and Fred Worthy, Summerville Baptist Church , as well as our Supporters whose generous contributions make these concerts possible! 2nd Annual "Handel's MESSIAH Sing-Along"
The performance was conducted by Dr. Valerie Bullock, Director of the The Singers of Summerville, and Chair of the Horton School of Music, Professor of Music and Director of Choral Activities at Charleston Southern University, North Charleston, South Carolina; Instrumentalists were: Alex Boissonnault, violin Mary Taylor , violin Ben Weiss , viola Norbert Lewandowski, cello, Elizabeth Knott, oboe, Norm Lambert, oboe, and Julie Harlowe, Harpsichord. Rehearsal accompanist was Leah Megli. The combined performance was conducted by Dr. Valerie Bullock, Director of the The Singers of Summerville, and Chair of the Horton School of Music, Professor of Music and Director of Choral Activities at Charleston Southern University, North Charleston, South Carolina. Assistant Conductors for the program were David Richardson, Director of Choral Activities, Fort Dorchester High School, North Charleston, SC, conductor of the Charleston Symphony Spirtual Ensemble, and Assistant Director of Music, Bethany United Methodist Church, Summerville, SC; and Pamela S. Brunson, National Board Certified Teacher and Musical Educator at Rollings Middle School of the Arts. RMSA choirs have performed a wide variety of choral literature, including many master works and have received superior ratings in stage and sight-reading at SCADA and SCMEA conferences. In addition to school activities, Mrs. Brunson is the organist at Hibben United Methodist Church in Mt. Pleasant, SC. Piano accompanist was Leah Megli, BME Illinois Wesleyan University who has held accompanist postions at Illinois State University and Charleston Southern University. Chamber ensemble instrumentalists were: Tacy Edwards, flute, Elizabeth Knott, oboe, Charlie Messersmith, clarinet, Kathy St. John, bassoon, Nicholas V. Holland, III, timpani, Michael Haldeman, persussion, Kathleen Wilson, harp, Tom Bresnick, double bass, and David Friddle, organ. "An Afternoon of English Music"
The performance was conducted by Dr. Valerie Bullock, Director of the The Singers of Summerville, and Chair of the Horton School of Music, Professor of Music and Director of Choral Activities at Charleston Southern University, Charleston, South Carolina. The organist was English G. Morris Jr. Professional musician and President and Founder of Carolina Music Academy, a 36-year-old community music school and conservatory in Columbia, SC. Instrumentalists were: Tacy Edwards, flute Elizabeth Knott, oboe Megan Johnson, cello Nicholas V. Holland III, percussion, and Josh Bohl, percussion. David Richardson Director of Choral Activities, Fort Dorchester High School, North Charleston, SC. served as rehearsal accompanist. The performance was conducted by Dr. Valerie Bullock, Director of the The Singers of Summerville, and Chair of the Horton School of Music, Professor of Music and Director of Choral Activities at Charleston Southern University, North Charleston, South Carolina. The Assistant Conductor and accompanist was David Richardson Director of Choral Activities, Fort Dorchester High School, North Charleston, SC and percussionist was Dr. Nicholas V. Holland, III Associate Director of Bands, Director of Athletic Bands and Area Coordinator of Instrumental Studio and Chamber Ensembles at Charleston Southern University. Special Thanks to Linda Falter, and Eddie Sayetta, Ed Barnes, and Fred Worthy, Summerville Baptist Church , as well as our Supporters and all others who helped make this concert possible! The performance was conducted by Dr. Valerie Bullock, Director of the The Singers of Summerville, and Chair of the Horton School of Music, Professor of Music and Director of Choral Activities at Charleston Southern University, North Charleston, South Carolina, and David Richardson Director of Choral Activities, Fort Dorchester High School, North Charleston, SC. The organist was John Randall Hawkins Formerly a California collegiate-level teacher and currently a student accompanist at Charleston Southern University. Instrumentalists were: Asako Kremer, violin Mayumi Smith, violin Alex Agrest , viola Damian Kremer, cello, Michael Smith, trumpet, Todd Jenkins, trumpet, and Beth Albert, tympani. The performance was conducted by Dr. Valerie Bullock, Director of the The Singers of Summerville, and Chair of the Horton School of Music, Professor of Music and Director of Choral Activities at Charleston Southern University, Charleston, South Carolina, and David Richardson Director of Choral Activities, Fort Dorchester High School, North Charleston, SC. The organist was English G. Morris Jr. Professional musician and President and Founder of Carolina Music Academy, a 36-year-old community music school and conservatory in Columbia, SC. Instrumentalists were: Tacy Edwards, flute Elizabeth Knott, oboe Greg Homza, cello Michael Haldeman, percussion, and Josh Bohl, percussion. The performance was conducted by Dr. Valerie Bullock, Director of the The Singers of Summerville, and Chair of the Horton School of Music, Professor of Music and Director of Choral Activities at Charleston Southern University, Charleston, South Carolina, and David Richardson Director of Choral Activities, Fort Dorchester High School, North Charleston, SC. Piano accompanist Jennifer Luiken Professor of Voice and Director of the Lyric Theatre, Charleston Southern University.. The performance was conducted by Dr. Valerie Bullock, Director of the The Singers of Summerville, and Chair of the Horton School of Music, Professor of Music and Director of Choral Activities at Charleston Southern University, Charleston, South Carolina, and David Richardson Director of Choral Activities, Fort Dorchester High School, North Charleston, SC Instrumentalists were: Marsha Goldsmith staff accompanist at Charleston Southern University, piano, David Michael Ruddy, bass, and Andrew Felker percussion. The performance was conducted by Dr. Valerie Bullock, Director of the The Singers of Summerville, and Chair of the Horton School of Music, Professor of Music and Director of Choral Activities at Charleston Southern University, Charleston, South Carolina, David Richardson Director of Choral Activities, Fort Dorchester High School, North Charleston, SC and Pamela Brunson Director of Choral Music at Rollings Middle School of the Arts, Summerville, SC. Instrumentists were: Gregory R. Homza, AAGO Director of Music at Saint John the Beloved Catholic Church, organ Marsha Goldsmith staff accompanist at Charleston Southern University, piano, Michael Haldeman, percussion and Kathleen Wilson harp. "A Little Mozart and Haydn"
"A Tribute to Irving Berlin"
A Christmas Garland arr. by Conrad Susa featuring the Combined Choirs and Festival Orchestra Musical selections were conducted by Dr, Valerie Bullock, Chair of the Horton School of Music, Professor of Music and Director of Choral Activities, and Director of the Singers of Summerville, Marshall Forrester, Associate Professor of Music / Director of Instrumental Studies, Richard Bordas, Assistant Professor of Music, and Jean Breza, University Children's Chorus Director. 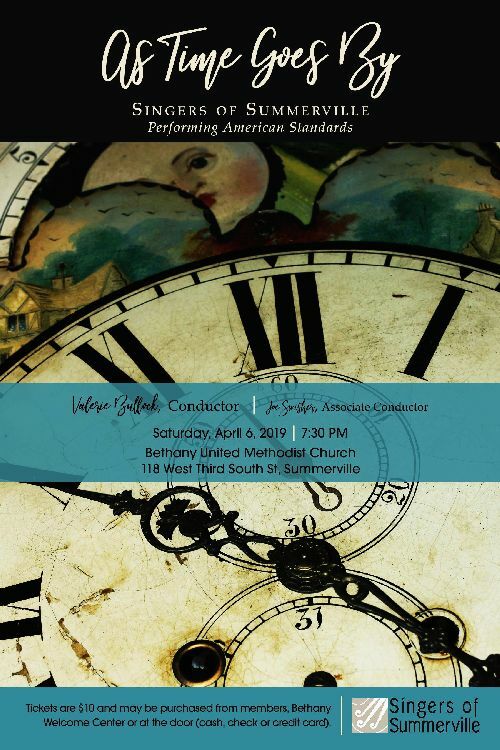 Conducted by Dr. Valerie Bullock, Director of the The Singers of Summerville, and Chair of the Horton School of Music, Professor of Music and Director of Choral Activities at Charleston Southern University, Charleston, South Carolina. Piano accompaniment by: Dr. Jennifer Luiken, Associate Professor of Voice at Charleston Southern University, Charleston, SC. "We Get a Kick Out of Cole"
Conducted by Dr. Valerie Bullock, Director of the The Singers of Summerville, and Chair of the Horton School of Music, Professor of Music and Director of Choral Activities at Charleston Southern University, Charleston, South Carolina. Instrumentalists were: Dr. Jennifer Luiken, Associate Professor of Voice at Charleston Southern University, piano, Ben Rhodes, percussion, David Michael Ruddy, bass and Mark Sterbank, saxophone. Conducted by Dr. Valerie Bullock, Director of the The Singers of Summerville, and Chair of the Horton School of Music, Professor of Music and Director of Choral Activities at Charleston Southern University, Charleston, South Carolina. Wie lieblich sind deine Wohnungen from Ein Deutsches Requiem, Op. 45 by Johannes Brahms (1833-1897) - Three Scottish Folksongs: O Whistle and I’ll Come to Ye, Soloist: Aubrey Bruce Darby My Love’s in Germany, Soloist: Kelsi Whitehorn and I’ll Ay Call in by Yon Town, Accompanists: Janet Elshazly and Susan Cadwell arr. by Mack Wilberg (b.1955) - AMOR DE MI ALMA (You are the Love of My Soul) and How Can I Keep From Singing? by Z. Randall Stroope (b.1953) - Serenade To Music by Ralph Vaughan Williams (1872-1958) Words by William Shakespeare (1564-1616) Soloists:Ashley Wulf, Matt Sims, Kendrick Moses, Robert Culbreth, Tanner Nix, Tony Dunlap, Shanelle Woods, Laquavia Alston, Mary Fabel, and Betsy Ivonowsky - Ride On, King Jesus, Soloist: Laquavia Alston and Hear My Prayer by Moses Hogan (1957 - 2003) and When In Our Music God Is Glorified arr. by Mark Hayes with lyrics by Fred Pratt Green. The entire ensemble was conducted by Dr. Valerie Bullock, Chair of the Horton School of Music, Professor of Music and Director of Choral Activities at Charleston Southern University and Choral Director of the Singers of Summerville. Dr. Jill Terhaar Lewis Assistant Professor of Music at Charleston Southern University, and Baritone Dr. Anthony Offerle, Associate Professor at the University of Florida School of Music. The entire ensemble was conducted by Dr. Valerie Bullock, Chair of the Horton School of Music, Professor of Music and Director of Choral Activities at Charleston Southern University. "Songs of Faith and Freedom"
Songs of Faith by Paul Basler (b.1963) Featuring Brandon Nichols, French Horn and Susan Cadwell, Piano - Psalm 150, Be Thou My Vision, Ubi Caritas, Psalm 23, and Alleuia. The Testament of Freedom by Randall Thompson (1899-1984) A Setting of Four Passages from the Writings of Thomas Jefferson composed in honor of the two hundredth anniversity of his birth. Featuring The CSU Festival Wind Ensemble - I-The God who gave us life, II-We have counted the cost, III-We fight not for glory and IV-I shall not die without hope. "Musicals of the 50s and 60s"
Oliver (1960) by Lionel Bart (1930 - 1999) (1. Consider Yourself 2. Where Is Love? "Songs of Thankfulness and Praise"
Baritone - Dr. Anthony Offerle - University of Florida director of the opera workshop program, and the instrumental/vocal ensemble director for the fall musical. The entire ensemble was conducted by: Dr. Valerie Bullock, Chair of the Horton School of Music, Professor of Music and Director of Choral Activities at Charleston Southern University and current Director of the Singers of Summerville. "Choral Music Through the Ages"